All over the Hawaiian Islands small churches are tucked into isolated ocean coves and mountain valleys. Some are hidden amidst modern buildings in Hawaiian cities and towns. Before Hawaii became a tourist’s paradise, Christian missionaries left their homes and families and traveled across oceans to build many of these churches. The cemeteries surrounding the churches hold their children who died due to illness. The early missionaries sacrificed much in their effort to bring the gospel to the islands. The idea for my photographs was birthed several years ago at a Christmas Eve Candlelight service beside the ocean at Keawala’i Congregational Church in Maui, Hawaii. That night some parishioners reflected on their early memories of attending this church before there was a paved road and before hotels and condominium dotted the shores. Getting to church was very different from today. I wanted to record a part of Hawaii that was disappearing, and began seeking out the early missionary churches. 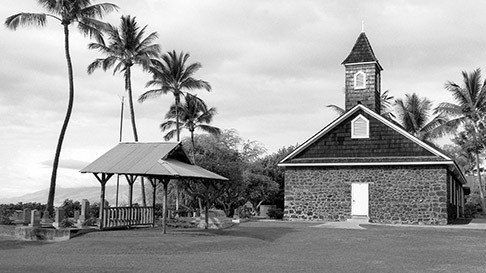 I began taking black and white photographs of all the pre-World War II churches in the Hawaiian Islands. It was a challenge to photograph the churches without skyscrapers in the background, with no electrical and telephone wires overhead, without cars driving by, and without people milling around. This was difficult, as many of the churches are now tourist attractions.